The Rolled Hem is called Orlo a Prillo, Prillino or Birello and probably other names in Italian in the different regions of Italy. It has been a difficult one for me to do. 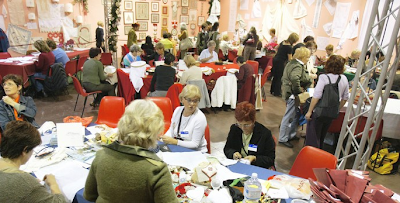 While at the EGA Seminar a few weeks ago, I sat with Signora Derna and watched her execute a Rolled Hem on the Assisi Embroideries that she was making. Fascinated, I watched her again and again. She made it look so effortless... so easy. I didn't make any notes and couldn't take any photos - she was so fast! I still don't know if I'm doing it like she did. I checked through my books and found at least three different methods for executing the Rolled Hem. Fundamentally they all begin the same way. With spit. Yes, I said spit. I have had more than one maestra tell me this. If you lick your floss when you thread your needle, you won't be too grossed out, if not, well... you need to get over it. Spit washes out. Water dampening your fingers works eventually, but not nearly as well, and you almost always get your fingers too wet. What helped me get it was using a high count fabric first until I got the hang of it, and then trying a more openweave fabric. 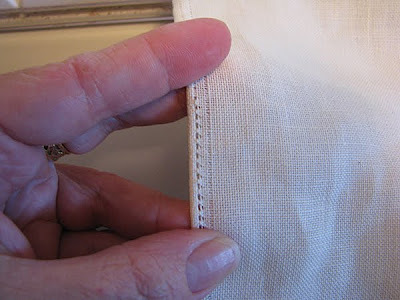 Yesterday a reader asked me to explain how to do the Rolled Hem so I'm going to attempt it here for her and any others who may be interested, please remember that this is only one of many ways to do it. I'm demonstrating on 38ct Sotema ivory-coloured linen 20L, which is my favourite linen right now. It's a beautiful weight of fabric and very compactly woven. First, I withdrew one fabric ground thread about 10 ground threads in from the edge of my fabric (make sure your cut is straight!). Then I skipped four ground threads and withdrew another one. 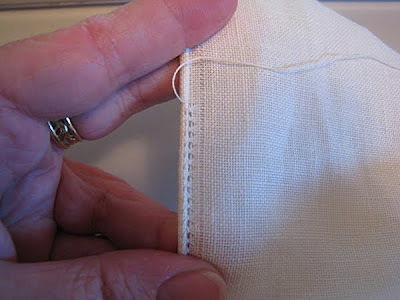 This is the setup for doing the Four-Sided Stitch which is usually found in combination with a Rolled Hem on Assisi work. 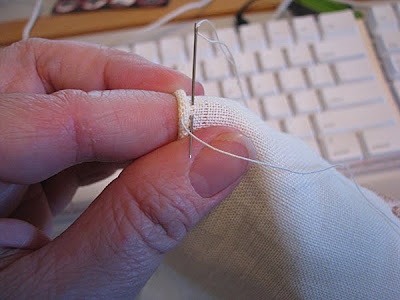 If I had more time, I would do the Four-Sided Stitch first to group my threads into squares over four ground threads. Don't start at the very bottom, but a little above and just keep rolling and squeezing until you get some control. The motion of it reminds me of the way an old boyfriend used to roll his cigarettes. My original exit position in the roll should be about level with my exit position in the withdrawn channel. 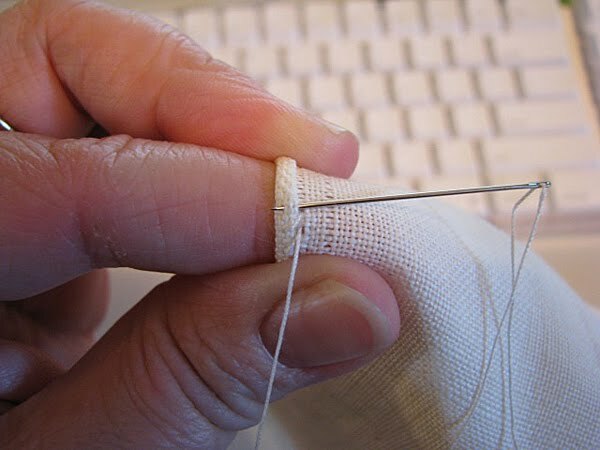 Then going up to where I entered the withdrawn channel, I enter with my needle into the roll, keeping the same distance as before (about two ground threads), the needle goes between the roll and the fabric, that is, you never come out on the front side when entering into the roll. Okay, I swear that I only came out at a distance of two ground threads into the roll but while trying to position the camera my roll came slightly undone - it's hard to do this and take close-up photos with only two hands! Everything is stitched with the fabric over your index finger. I'm working directionally along the edge from bottom to top but I thought Signora Derna worked top to bottom and came out already into her roll... that is, without taking a separate step like I'm doing here, but I just don't seem to be able to figure that out right now. Sorry my photos aren't better, my photographer is not home this afternoon and I probably should have used coloured thread! See? I'm learning too! Devotional Scapulars or Sacramentals are small pouches of cloth attached to a band and worn by around the neck as a symbol of a religious pledge, promise or sign of devotion - largely used by the Catholic faith. These "scapolari" as they are called in Italian can also be worn specially during religious functions like processions or special Masses. Silver reliquaries containing the relics of saints or items from a beloved can be placed inside the pouches. A very kind gentleman from the MI 1906 Ning group (for those interested in the 1906 World's Fair in Milan) wrote to tell me that in reorganizing his collections he came across some scapulars that he knew I would be interested in. These scapulars are from 19th century southern Italy and no two are the same. As I understand it, each scapular was hand-embroidered by the person who wore it and it was decorated according to each wearer's own imagination and creativity and according to the purpose which they desired to represent. The embroidery on all these scapulars is exquisitely done and in great shape. A heartfelt thank you to Ampelio for sharing his photos with us! Yesterday I received a delightful email from a Sicilian lady who wanted to compliment me on my blog. She told me that she had recently started her own website about a needlework technique that she fell in love with about six years ago and taught herself how to do: Circular Filet Lace. To me, making regular Filet netting looks difficult, but I understand that making Circular Filet netting is even more challenging! Of course I had to go and have a look at her website right away! Enza Termine is a mother of three who lives near Palermo on the island of Sicily at the very southern part of Italy. She tells of being struck by the beauty of pieces of Circular Filet Lace resting on a fig tree outside of the Cathedral of Lipari, one of the largest islands to the north of Sicily. She approached the two elderly people selling the lace and asked who had made it. To her great surprise, she discovered that it was the husband, a retired fisherman, who had produced the pieces. She bought the piece that is pictured on her biography page from them. After that she searched for information on what she discovered was an art form on the verge of dying out. With the help of a friend she learned how to make filet netting and after much searching and the aid of an old Mani di Fata booklet, she was able to achieve the Circular Filet netting called "Rete a Rosoni" [rose netting, rose intending the big rose windows in cathedrals]. Click on her gallery page to view all of her amazingly beautiful works and don't forget to click on the little flower next to "I lavori delle amiche e non solo" [the works of friends and more] to see work by her friends and at the top of that page don't miss "altri lavori" [other works] and "Natale" [Christmas] for some exquisite Christmas decorations. There are more photos under the "Eventi" [events] page and even more under "Novità" [news]. On the "Novità" page there are the works of a Sardinian lady in her 90s. If you can't get enough of Enza's work, there are more pictures here. Thank you Enza for telling me about your beautiful work! It's funny how one thing leads to another. Many times when I start out researching one thing, I end up discovering several other things of interest. 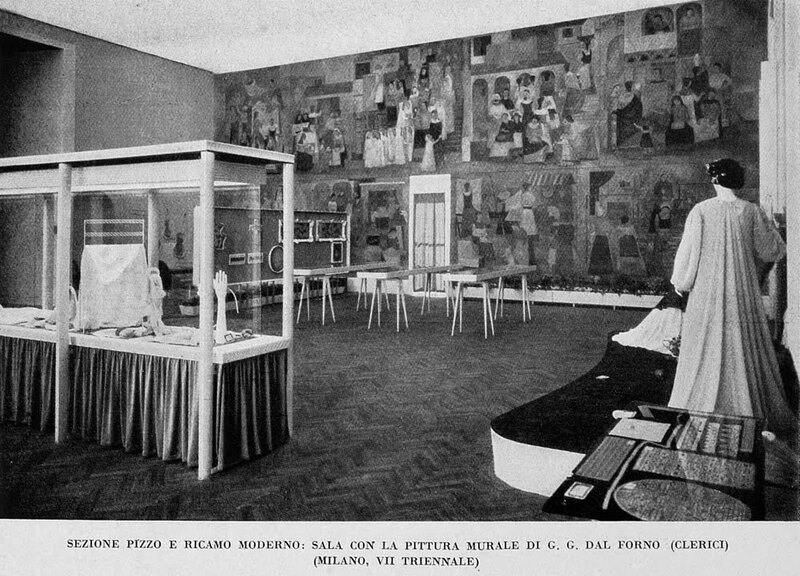 I have been trying to find a copy of the 1939 publication: Il lavoro di ricamo alla VII Triennale di Milano, Milano. Catalogo della mostra. [The work of embroidery at the 7th Triennial of Milan. Exhibition Catalogue] because I'm sure it will have lots of photos of Piero Fornasetti's designs that were executed in Piave Embroidery on Tulle. This is an embroidery from the Modern Lace and Embroidery Section by I. Rignaschi from a design by A. Cattadori. Click on the photo for a closer look, it's really a lovely piece. As I'm no expert, I am guessing that this is not done on Tulle but could possibly have been executed on Batiste or some other very fine fabric. 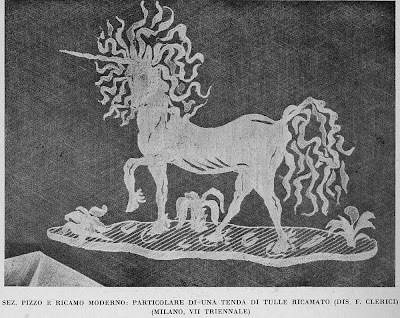 Again, from the Modern Lace and Embroidery Section, it is a detail from a curtain from a design by F. Clerici. However, it was the pictures of the room where the modern embroideries and laces were exhibited which caught my attention. Click on the photos or a closer look, you can see the fresco has several scenes. The caption says that the mural was done by G.G. dal Forno and then in brackets it says (Clerici). "F. Clerici" is the Italian 20th century artist Fabrizio Clerici (1913-1993) who received a prize for his work at the 7th Triennial in the setting up of the Lace and Embroidery section and for his Trompe l'oeil work in this section. (There is another photo in the article of the Trompe l'oeil but it is small and difficult to appreciate so I am not showing it here). I am sad to say that it seems that the painted works were destroyed by the World War II bombings in 1943. "G.G. dal Forno" was Gian Giacomo dal Forno (1909-1989) another artist who's work on this fresco earned him a gold medal at the Triennial. The author of the Emporium article tells that the Embroidery and Lace section of the Triennial was by far the best exhibit of the show. He tells of the exquisite works of Pia di Valmarana, Jesurum, Emilia Bellini, Racconigi, Alina di Ricaldone and the laces of Aquila and Pescocostanzo. Many more names and things to investigate for me to add to my never-ending list of things related to Italian needlework! If anyone can tell me about any of the artwork, people or companies mentioned here, would you please post below? In 1878 Romeyne Robert was born in New Jersey to American parents who traveled quite a bit and during a visit to Rome met her future husband the marquis Ruggero Ranieri di Sorbello. Soon after their marriage in 1902, the couple settled in to live at the 17th century Palazzo Sorbello in Perugia. This breathtaking palazzo is worth a visit as it houses important collections of paintings, prints, pottery, embroideries and one of Italy's most important libraries of rare texts. Marquess Romeyne felt a strong desire to help the country folk on her family's estates and set up a Montessori school (which, at the time, was a brand new teaching method) for children where she also initiated sewing and embroidery lessons for women. 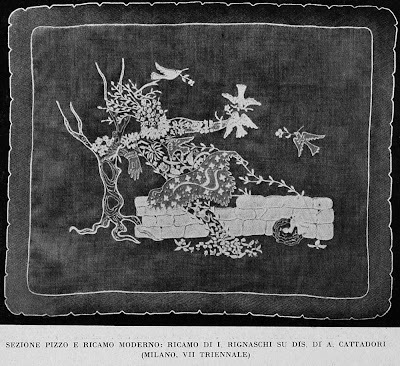 The success of these classes brought about the establishment in 1904 of an embroidery workshop called "Scuola Ricami Ranieri di Sorbello" [Ranieri di Sorbello Embroidery School] which she based on one of the Ranieri family estates called the Villa Pischiello near Lake Trasimeno in the province of Perugia. Starting with 8 employees, the workshop counted near to 150 employees at its peak of popularity and enjoyed success until 1934. 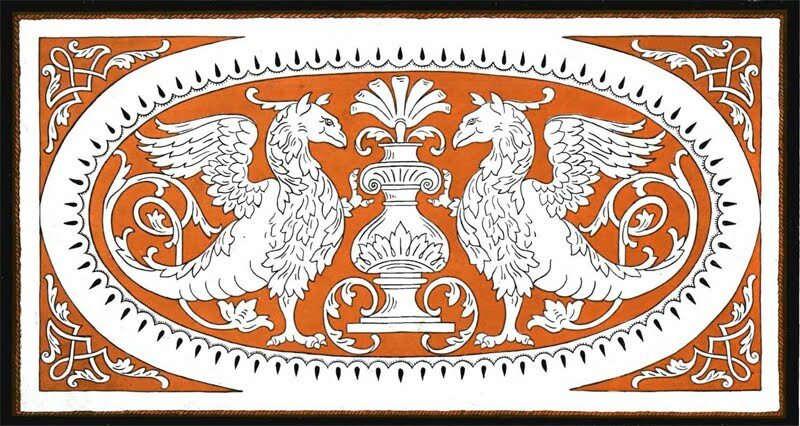 A co-operative named "Arti Decorativi Italiane" [Decorative Italian Arts] was started and opened a shop in the city of Perugia to sell the products of textile, lace and embroidery workshops from the surrounding area and even from a little farther away in the other regions of Italy. Together with Carolina Amari an extraordinarily talented needlewoman from Florence, the Marquess Romeyne developed the technique of Punto Umbro [Umbrian Embroidery], also known as Sorbello Embroidery and Pischiello Embroidery, from antique pieces in the personal collection of the Countess Edith Bronson Rucellai of Florence. "The Punto Umbro is the revival of an ancient and forgotten Arab stitch used in Italian, Spanish and Portuguese embroideries. It was discovered among some of the rare needlework in the fine collection of Countess Edith Rucellai. The stitch was deciphered, copied, and applied to renaissance Italian designs, through the ability of Signorina Carolina Amari of Florence, and has become the specialty of the school of embroidery founded, organized and directed at Pischiello, Passignano, by the Marquess Ranieri di Sorbello for the benefit of the women on her husband's estate and neighboring towns bordering the historic Lake Trasimeno, Umbria." Next time we will go into detail on the technique of Punto Umbro and talk about what is happening today to continue the tradition of this fascinating needlework and one of the particularly talented associations called P.Es.Co. For now, whet your appetite by checking out their photo galleries. 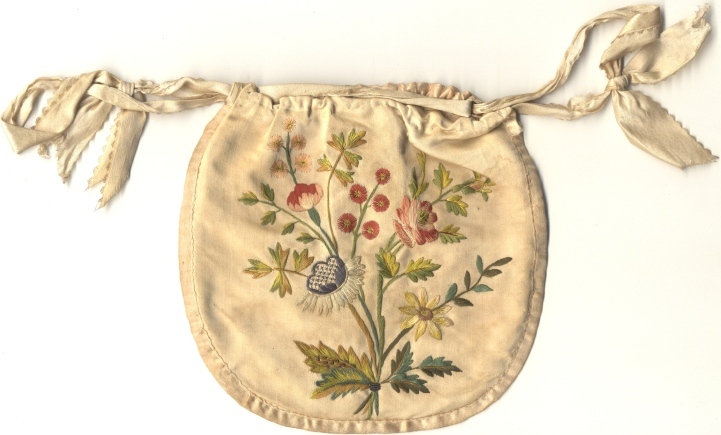 Many things from Italian needlework have become know to the English-speaking world in bits and pieces. For example, Assisi Embroidery is well known, but the rolled hem and small tassels which generally finish off an Assisi Embroidery piece done in Italy are almost never seen outside of the country. The same holds true for Palestrina embroidery. 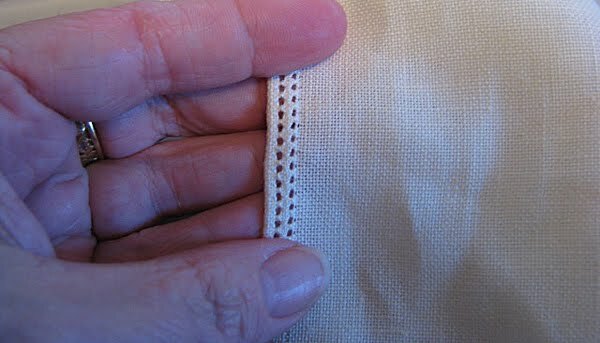 It's relatively easy to find English instructions on how to do the Palestrina Knot, but nothing is said about where it comes from or what type of embroidery it traditionally goes with. This delicious pattern is from an old RAKAM magazine from the early 1930s. It's for a cushion measuring 80 cm x 45 cm, done on Assisi linen (28ct). The magazine recommends No. 3 or 5 Pearl cotton thread if making this design into a tablerunner or finer Pearl Cotton if making a cushion. Traditional Palestrina Embroidery uses the Rush Stitch (Punto Stuoia) for filling in the background. Rush Stitch resembles Romanian Couching Stitch but the couching stitches are executed more randomly to achieve the effect of the way rushes looked when used as floor covering in the ancient houses of Italy. 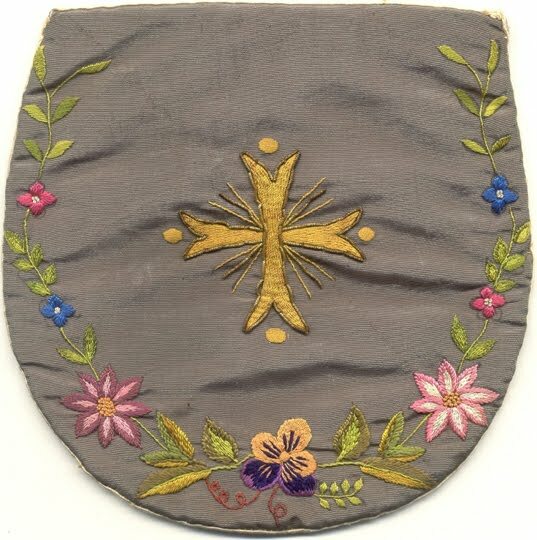 The design above is typical of Palestrina Embroidery, this one is based on a 16th century design. 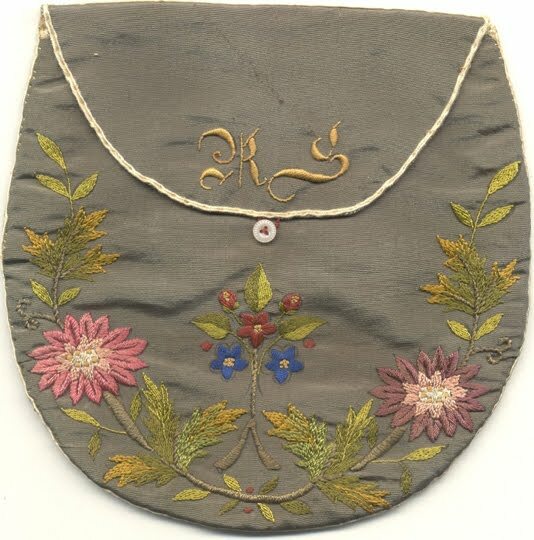 The figures are outlined in Stem Stitch, the background is filled in with Rush Stitch, the oval outline in Stem Stitch, the scalloped oval in Palestrina Knots, the teardrops in Satin Stitch, the outer corner designs are outlined in Stem Stitch and the backgrounds are filled with Rush Stitch. Colour combinations recommended are: porcelain blue for the filling/dark brown for the outlines, gold/bronze-green, antique purple-red or Pompeii red/old gold. 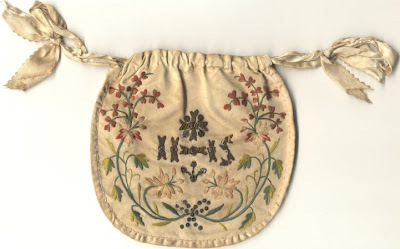 This embroidery is named after a town in the Latium (Lazio) region called Palestrina, the ancient Praeneste, near Rome. According to some, the origin of this embroidery dates back to the second century AD. More certain is the fact that in Palestrina in 1907, the "School of ancient embroidery - Ars Palestrina" was founded by the Marquis of Florence Alfredo Uliveri. 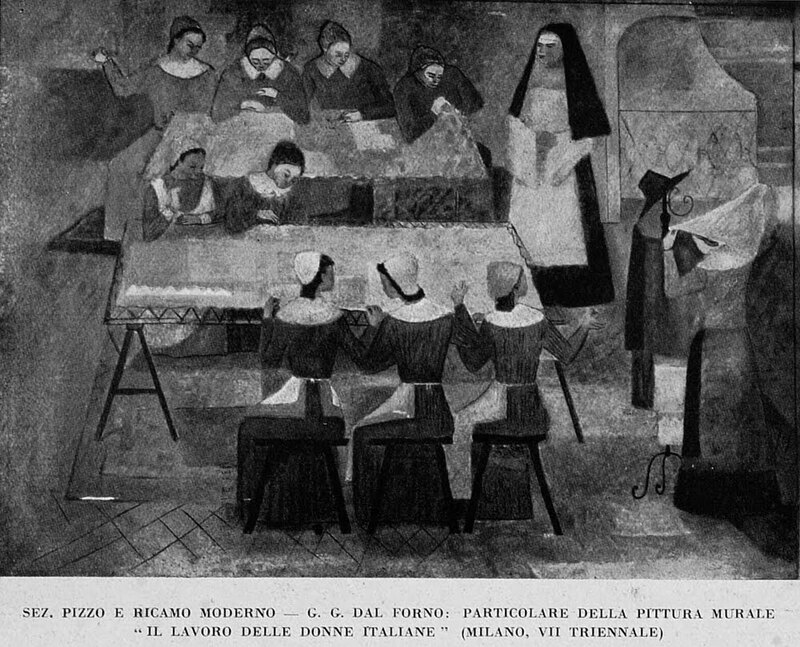 The school, located on the first floor of the Palazzo Barberini, executed various kinds of embroidery from ancient stitches and in particular Palestrina Embroidery, "invented" by the founder of the school. Some years later in 1919, once again in Palestrina, Luigi Croce opened a workshop which didn't close its doors until 1969. The workshop reproduced Italian masterpieces (of Perugino, Raphael, Byzantine depictions, etc...). 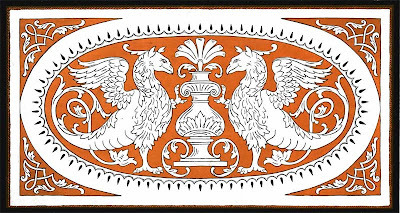 The trademark of this workshop was to execute the drawings on white fabric, leaving the motifs empty and filling in the background with the needle. The Palestrina Knot is suitable for lines, outlines and curved designs. It is executed from left to right, forming a series of knots, close together or farther apart, giving a raised effect to the work. The background is filled with Rush Stitch and needlewoven picots are used to finish the edges along the hem. 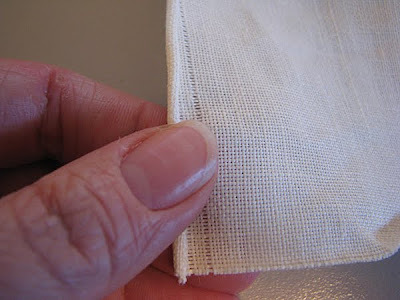 Twisted cotton thread or pearl cotton is used on natural coloured fabric to produce the best effect. Click here to see several beautiful works of Palestrina Embroidery by Stella Chiapparelli. If you can find it, Adele della Porta wrote a booklet on this technique in 1919 or there is Palestrina artigiana e rurale by Attilio Borzi, Editrice I.T.L. Palestrina, 1979. If you happen to be in Italy in the second half of October this year, you might think about going to the trade fair Abilmente in Vicenza which is in the northern part of Italy between Verona and Venice, close to Padua. From October 21st to 24th, 9:30am to 7pm. It seems that many textile arts and hobbies will be represented at this fair: felting, quilting, sewing, embroidery and lace making. A few of the embroidery and lace schools from Italy will be present and have each participated in making pieces for the exhibit of embroidered bodices and vests. 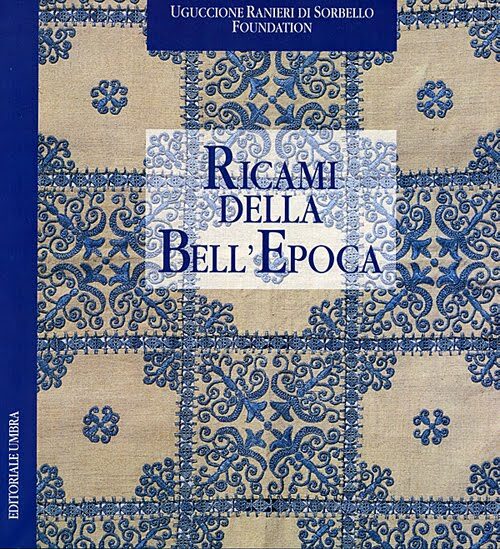 There is to be a large bookshop, workshops and some exhibitions like pieces from the famous collection of Loretta Caponi, a collection of Japanese quilts and pieces stitched by the members of the social network Amoricamo [I love embroidery]. An area is reserved for creative recycling (click on the website links for a preview of some of the creative ideas) and naturally there will also be booths from which to buy all your favourite things like, threads, beads, fabrics and gadgets! See photos on their Facebook page from past events. Vicenza is a city rich in history so don't forget to have a look around town at the numerous sights and visit the Civic Museum housed in a palazzo designed by the 16th century architect Andrea Palladio. Slowly, slowly I'm getting organized. I've been home from San Francisco for 4 days and while there are still piles of things to sort, the piles are getting smaller! Beautiful Italian needlework from Assisi, Panicale, Deruta, Perugia, Lake Trasimeno and other towns in the delicious region of Umbria, Italy. Clara Baldelli Bombelli of the Giuditta Brozzetti workshop with some of her daughter's handwoven pieces. 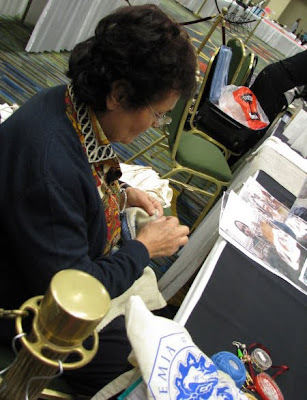 Signora Derna stitching some Assisi work (she's been doing it since she was 5 years old! ), she was a joy to watch. 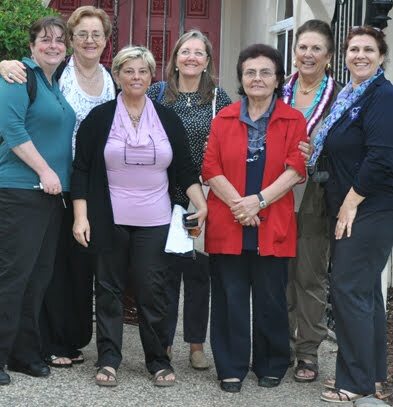 It was her first ever journey outside of her hometown of Assisi, Italy and she had an excellent time in San Francisco. Anna Maria Porzi braves an extreme close-up to display some beautiful crocheted earrings from the Lake Trasimeno area of Umbria. 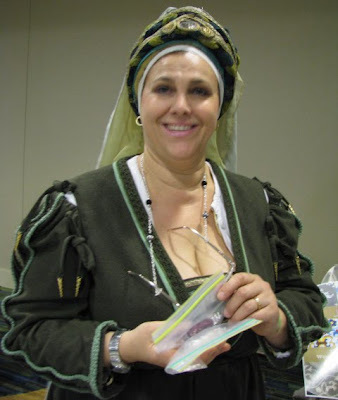 On Market Day the two ladies from Assisi dressed in Medieval garb to sell their wares, this is Tiziana Borsellini, President of the Accademia Punto Assisi. 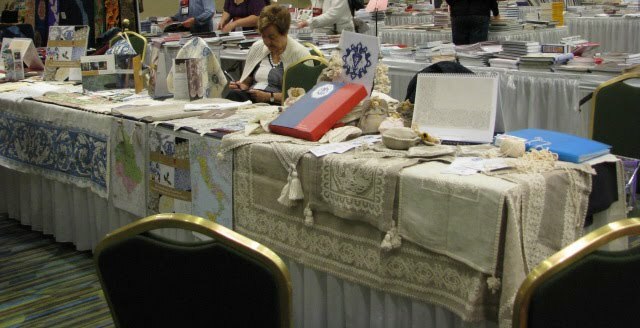 It was a fantastic week of Italian needlework emersion. I helped the Italian ladies with their display tables and their booths on Market Day, I took Vima deMarchi Micheli's four day Notebook of Italian Embroidery course, attended her lecture on September 5th and helped with her Exhibition on September 8th. On the 12th of September we rented a car and drove up to Vima's home for one last taste of La Dolce Vita before returning to our respective homes. I miss them all already! Thanks to my daughter for taking the group shot! 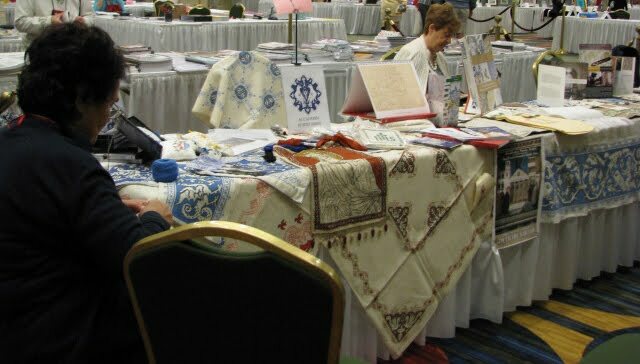 I'm back from the EGA National Seminar and I want to first post the links of websites that I like to buy Italian needlework supplies from as I promised my fellow classmates in Vima deMarchi Micheli's Notebook of Italian Embroidery class. The following are two websites that I have ordered from many times and which also take PayPal as a method of payment which is so much easier for overseas customers than a money order. Italian Needlecrafts - Elena speaks English well and goes the extra mile to make sure everything goes smoothly. Her website is in English, you can order through a secure socket and she will confirm shipping costs by email. She is based right in the city of Milan and so her deliveries do not take long to arrive. Elena is open to requests, if you are looking for something in particular, ask if she can get it for you. Her website is constantly growing and it is advisable to check back often as she is always adding new things. 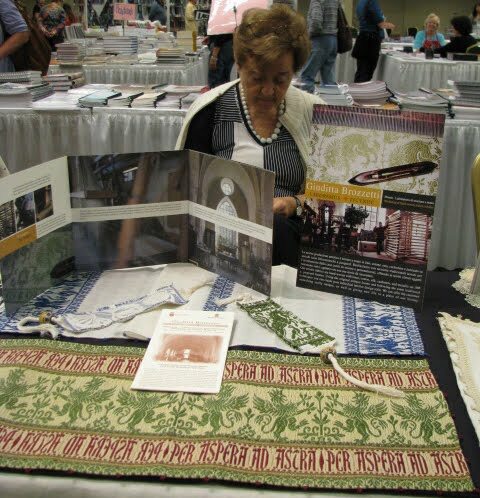 She carries books, patterns, fabric, threads and some kits and she is scanning lots of early 20th century Italian needlework books from her collection and making them available as free downloads. She also weaves in her spare time and you can buy her creations from her website or her Etsy page and follow what she's doing on her blog. Tombolo Disegni - Gianfranca has a bricks and mortar shop in Grado which is a small island in the north-eastern part of Italy between Venice and Trieste. She is an accomplished bobbin lacemaker. Her shop is loaded with lots of things for all types of needlework. Her website is in Italian and you will have to send her an email with a list of the things you would like to purchase so she can then send you a PayPal request. She travels to many fairs and shows so sometimes she may not be able to answer your request right away and shipping takes a little longer as she is not on the mainland. Italy has it's own culture and it is important to remember that you are not ordering from a country which is similar to your own. Most often, needlework is a hobby not a job and therefore it takes second place to family and work. What I'm saying is try to be patient as responses are not always immediate. The Italian postal service is notorious for doing the most inconvenient things. These two websites in particular do their best to serve their customers but if there is a glitch, most often it is not something they have any control over like the mail service or ordering from suppliers. If you are searching for something that you don't find on either of these two websites, post a comment and I'll let you know if I know of any other websites where you might be able to purchase what you're looking for. I have a lot of catching up to do with emails and translations, it may be a few days before I can start posting again but don't give up hope, I have lots to share with you!